MIT faculty and staff traveled to Saudia Arabia to give well-attended updates on the Fellowship’s research progress and discuss admission with prospective applicants. 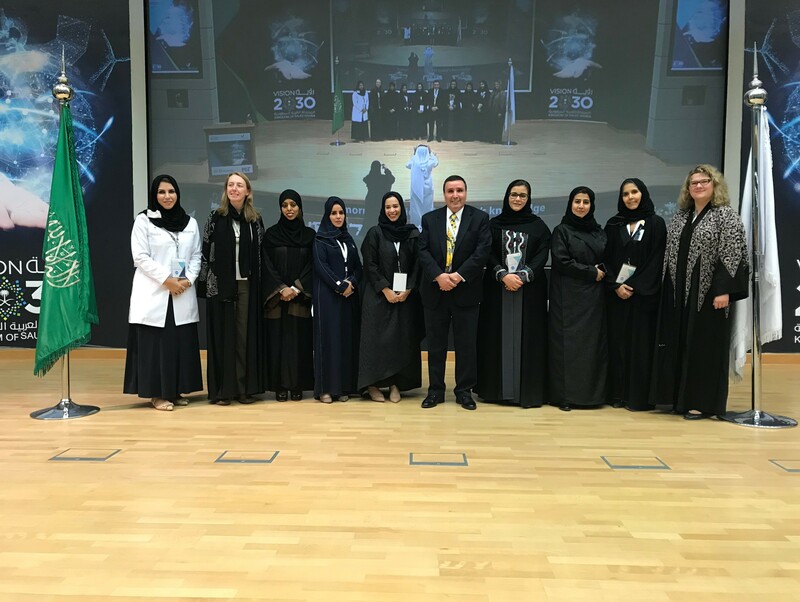 Program Manager Theresa Werth joined MIT Professor Kamal Youcef-Toumi and former Manager Kate Anderson in symposia at King Abdulaziz City for Science and Technology (KACST) and Effat University in Jeddah. Management presented an overview of the fellowship opportunity. They were joined onstage by former fellows Doctors Sufana Al Mashhadi (King Fahd Medical City), Areej Al Wabil (KACST), Sumayah AlSolaiman (Imam Abdulrahman Bin Faisal University), Omaima Bamasag (King Abdulaziz University), and Khulood Rambo (Effat University) who gave reports of their experience and work since MIT and by other fellows in attendance. Dr. Mansour AlSaleh from KACST hosted. Both events were capped by a keynote speech by Professor Youcef-Toumi on the Power of Innovation.